Cliques is designed to be a simple, transparent source of high-quality advertiser demand from only relevant, outdoor-related advertisers. This guide is designed to help you get our ads on your site as quickly as possible. Once you've created your new account, the first thing you'll need to do is to create a Publisher. Click the to access the Publisher setup wizard, which will guide you through the Publisher setup process. As you'll notice when you begin the setup process, Cliques uses a hierarchy of entities ( Publisher → Site → Page → Placement) to model your websites and organize your ad placements. For more information, see the article Publisher Hierarchy. 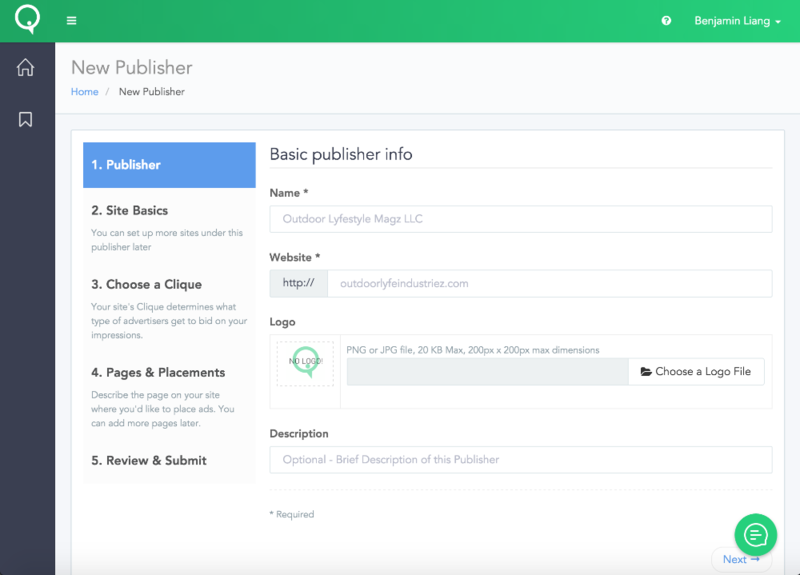 Once you've completed the Publisher setup process, the Cliques team will be notified will begin the process of approving your Publisher, Site, Pages and Placements. This typically takes at most 12 business hours to complete. For more information on how the approval process works, see Approval Process. When you list ad placements on Cliques, you're not just a serial number. You're a fire-breathing publishing hell-dragon, scorching everything you touch with your searing insights and originality, and BURNING TOWERS OF COMPLACENCY TO THE GROUND. [inhales] To that end, uploading a simple logo and writing a brief description of your site helps Cliques' Advertisers figure out what you're all about, and allows you to stand out. So don't skimp here. When setting up your Site, you will be asked if you want to input a Price Floor. Think of a Price Floor like a "Reserve Price" for an eBay auction -- the lower you go, the higher the chance your impressions get sold; the higher you go, you'll make more for each impression, but you'll sell fewer impressions overall. For more information, check out the Setting Price Floors article. In general, you're best served by choosing to join the lowest-level Clique that makes sense for your Site, since Advertisers in your Clique and all parent Cliques will be able to bid on your impressions. For more information, please see the Choosing a Clique article. A Default Condition is invoked when a real-time bidding auction fails, meaning that there are no eligible bidders for a given impression. Cliques lets you configure Default Conditions in a number of ways to best suit your website's ad-serving configuration. The next step after you've set up your Publisher is to configure your Default Conditions. Browse to the Page you created in Step 1 (go to Sites → [Your Site] → Pages → [Your Page]) and check out the Placement Manager. Click on any of the cells in the Default Condition to bring up the Default Condition configuration window. Custom Creative Display a custom creative, such as a house ad, PSA, pretty picture, etc. You can upload multiple images, and one will be selected at random when the Default Condition is called. 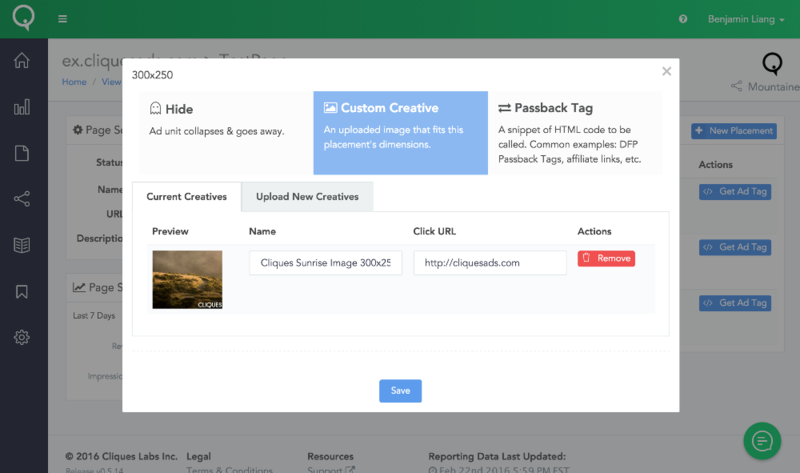 Passback Tag A snippet of HTML code provided by a 3rd party (such as Google DFP or AvantLink). If the Default Condition is invoked, this code will be injected directly inside of the ad tag, passing the impression back to the 3rd party. Currently, we do not validate passback tags for errors, so please be sure to test your placements before serving. For instructions on how to export passback tags, click here. In the same Placement Manager panel you just used to configure Default Conditions in Step 2, click the button to bring up the Tag configuration window. All there is to do now is copy / paste the ad tag provided here either directly into your page's HTML source code in your desired location, or into your 3rd party ad-server (e.g. Google DFP, Revive AdServer, etc.). 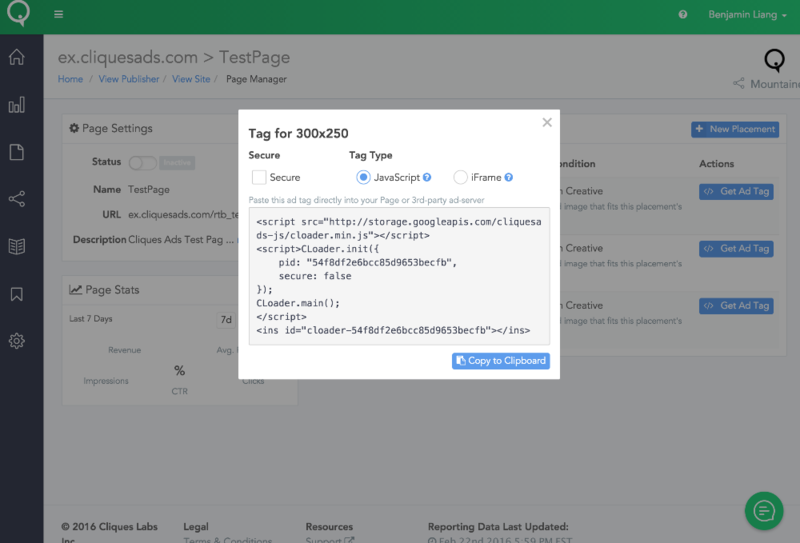 For more information on ad-tags and integration, please see Introduction to Ad Tags. All Placements will serve only Default Conditions until they have been approved and activated.